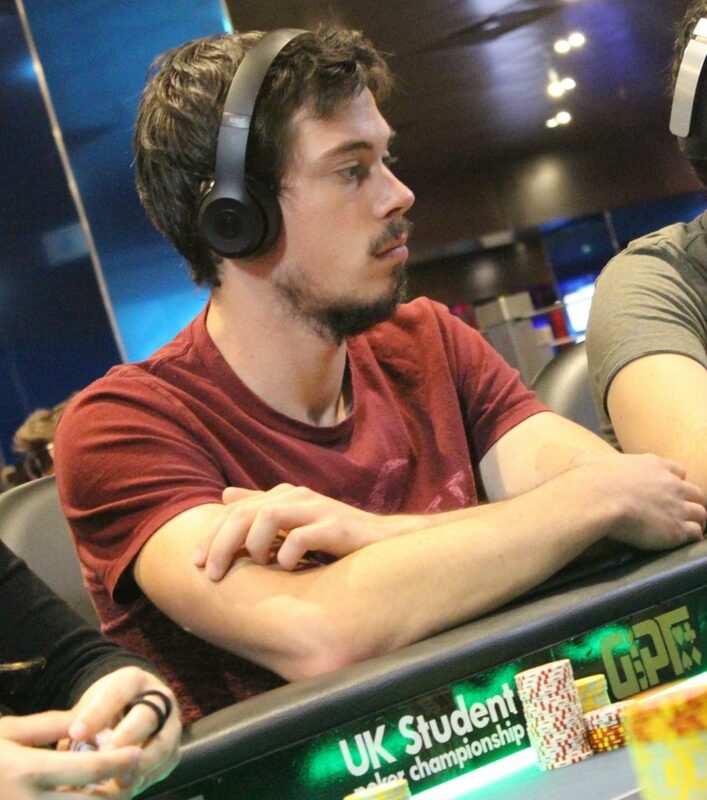 No spin up for Rob and he exits the tournament in 2nd place for £32,600. Another great run, but sadly he is the bridesmaid again. 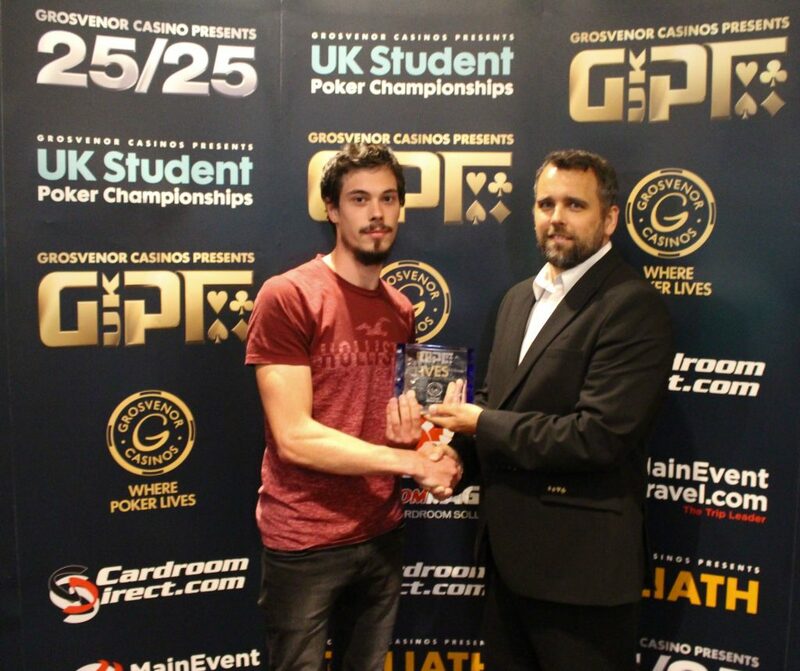 Patrik Szabo is the GUKPT London Main Event champion taking home a massive £49,150!! The two players get it all in for all but 35,000 of the chips in the tournament. Rob tables Queens for an over pair, but it’s no good as Patrick has the nuts with 5-6. The river is a meaningless 10 and Rob is crippled down to 35,000!! Steven gets up to 500k, but can’t manage to get over ten bigs and busts the main event in third. He takes home £19,850 for his efforts. We are now heads up!! Patrik all in holding :QhJd against the of Steven. 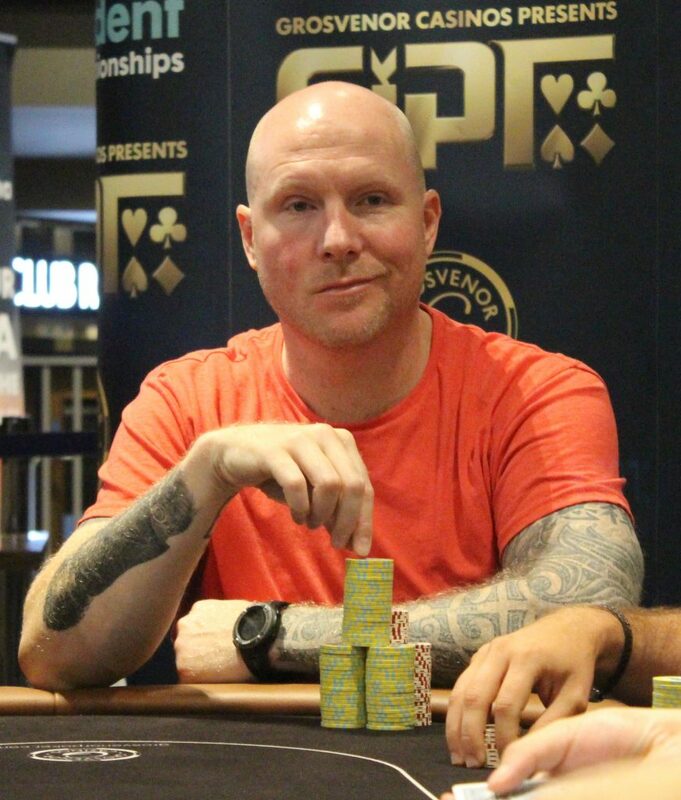 Patrik takes the pot and doubles up to a massive 3.4million! Steven is left with just 35,000! Jamie Le moves all in and is called by Steven Cole. Jamie tables and is in bad shape against the 7-7 of Steven. No three on the board and we lose Jamie in 4th place for £12,550. Rob Boon has just took an absolutely MONSTER off Patrick!! On the river Patrick bets 550,000 and Rob calls with FOURTH pair!! Fourth pair is good and Rob now has 4.5million of the 7 million in play. What a brutal 30 minutes for Paul Scipioni!! He shoves the small blind and is called by Patrik Szabo again in the big blind. Paul tables and will need help against the of Patrick. 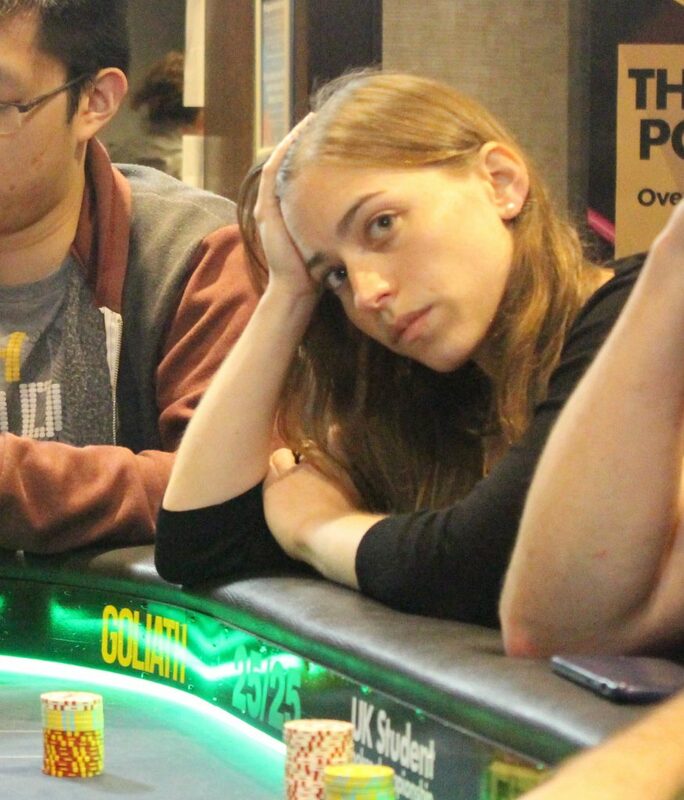 The flop comes as both player flop a pair. 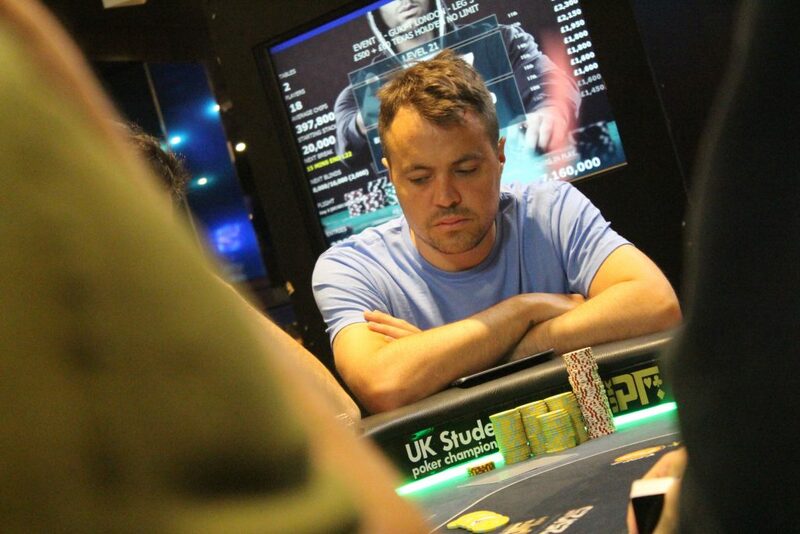 Paul loses the third hand in a row against PAtrik and heads out in 5th place for £8,400. 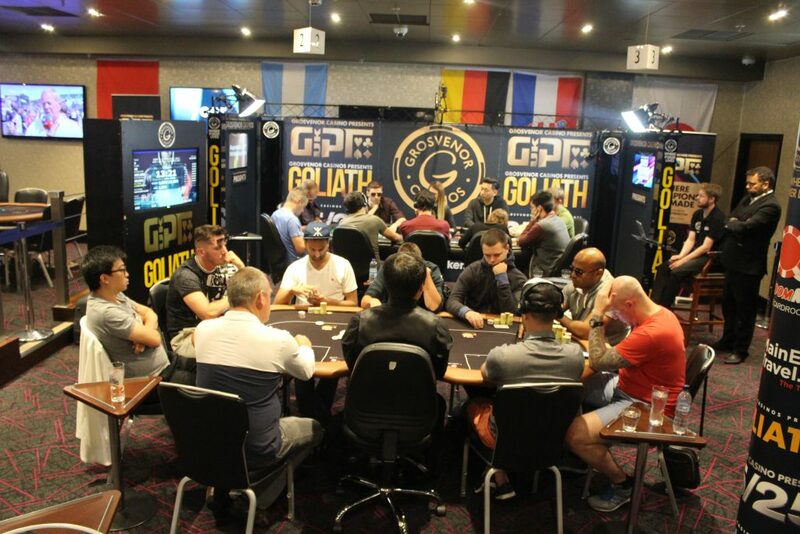 The action folds round to Paul Sipioni in the small blind who moves all in for 1.5million attacking the big blind of Patrik Szabo who has 900k in the big blind. Patrik calls it off and the cards go on their backs. The king plays for Patrick who takes the pot and has now doubled up to 1.9million. Paul is left with 600k. Patrik gets his short stack all in holding against the of Paul Scipioni. The flop comes as Paul flop a set, but Patrik flops a flush draw. Patrik rivers the flush to double up to 1.1million!! Paul is down to 1.5million. The blinds are now 30,000/60,000 with a 5,000 ante. 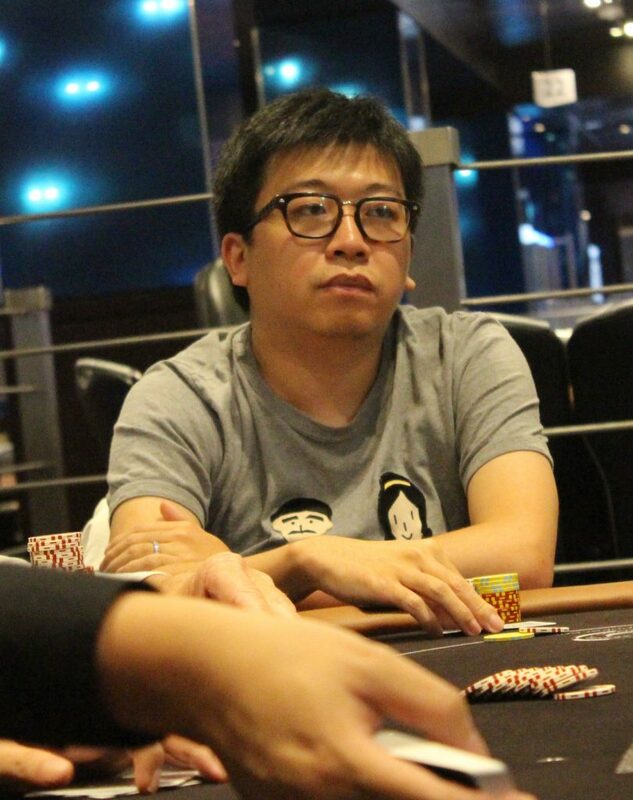 Keith Ongxun gets his 300,000 all in holding against the of Steve Cole. Tens are good for Steve to take the pot, he is now up to 1.1million. The blinds increase as we begin level number 27. Steven Cole shoves over an open from Keith Ongxun who quickly makes the call. Steven tables and is in bad shape against the of Keith. The river card comes !!! Straight for Steven as he doubles up to 960,000!! 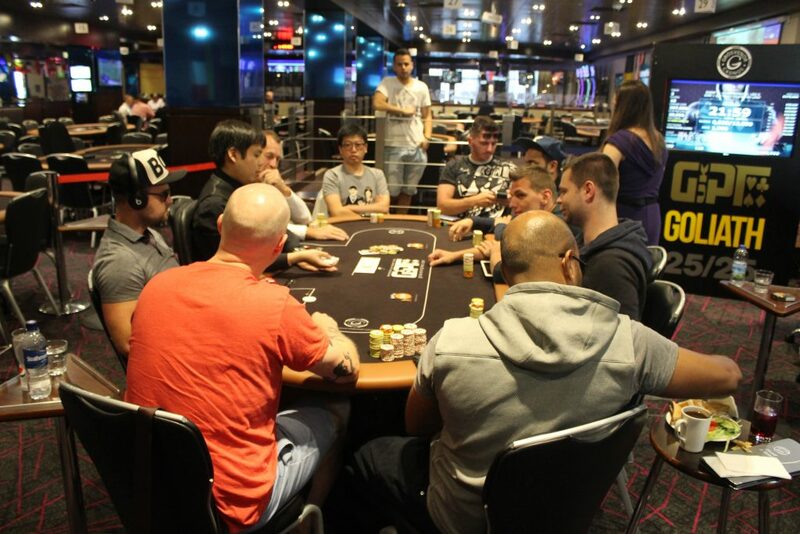 The players are back seated as we begin level number 26. Paul Scipioni opens, Kev Houghton moves all in for his 450k stack and Paul makes the quick call when the action comes back to him. Queens hold as Paul increases his stack to 2.6million. We lose Kev Houghton in 7th place for £4,650. Patrik Szabo opens, Mor shoves for her 10 bigs and Patrik makes the quick call. The king plays for Patrik who takes the pot. We lose Mor Kamber in 8th place for £3,950. A huge coinflip for 1.7million chips, a chip lead pot. Vikrum Mehta holding against the Pauul Scipioni. Queens hold for Paul who takes the pot, he increases his chip lead to 2.2million! We lose Vikrum Mehta in 9th place for £3,200. 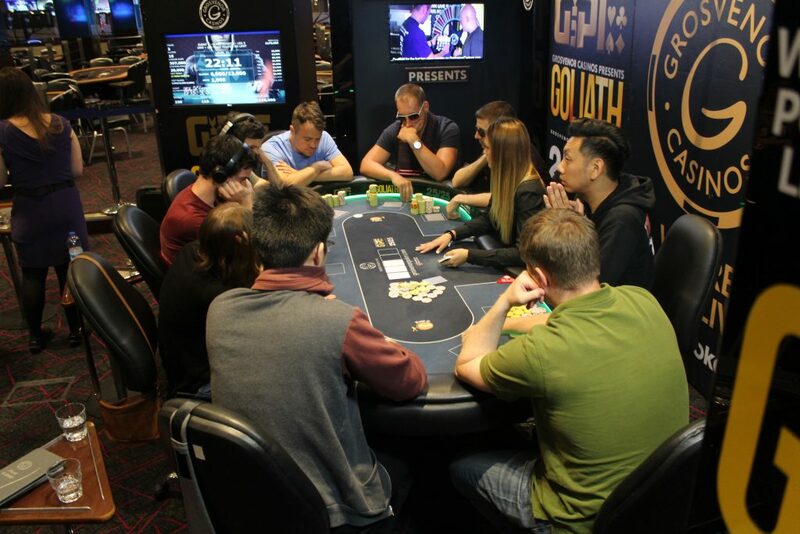 The GUKPT London Final Table is now underway!! 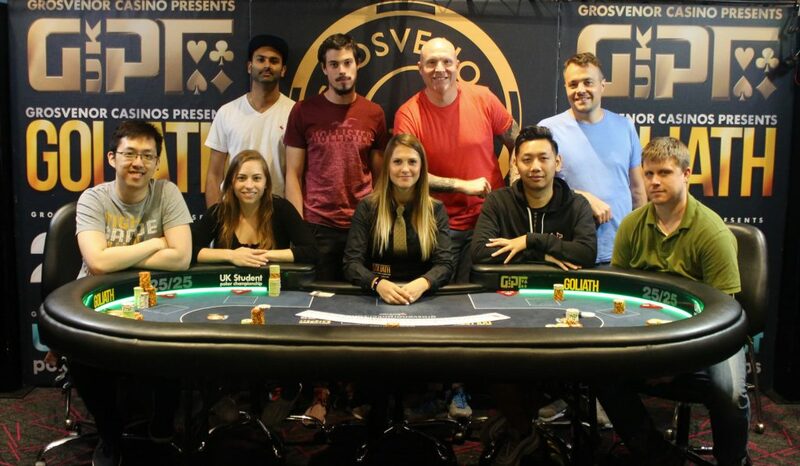 9 player remaining with £49,150 up top!! 20 minute beak now for the players. Then we will begin the final table. Kevin Williams gets his ten bigs stack all in holding and runs into the ACES of Keith Ongxun. Keith takes the pot with two pair and will take a million into the final table. 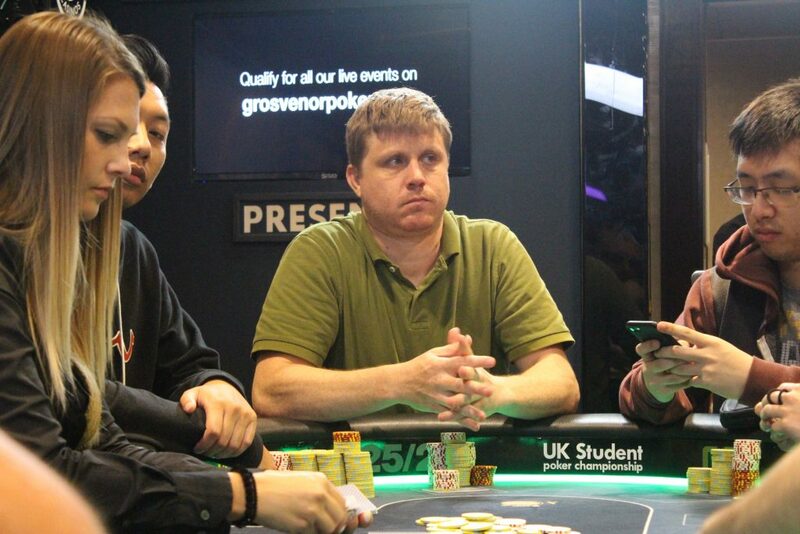 We lose Kevin Williams in 10th place for £2,850. We are now hand for hand for the final table. 10 players remaining. Vikrum Mehta opens to 40,000, Ryan Mandara moves all in for around 400,000! Paul Scipioni also moves all in, having Ryan covered. Vik gets out of the way and the cards go on their backs…. Ryan tables Ace Queen against the Ace King of Paul. The board runs out 3–9–5–8–10. Paul takes the pot with Ace-King high and now has around 1.4million. 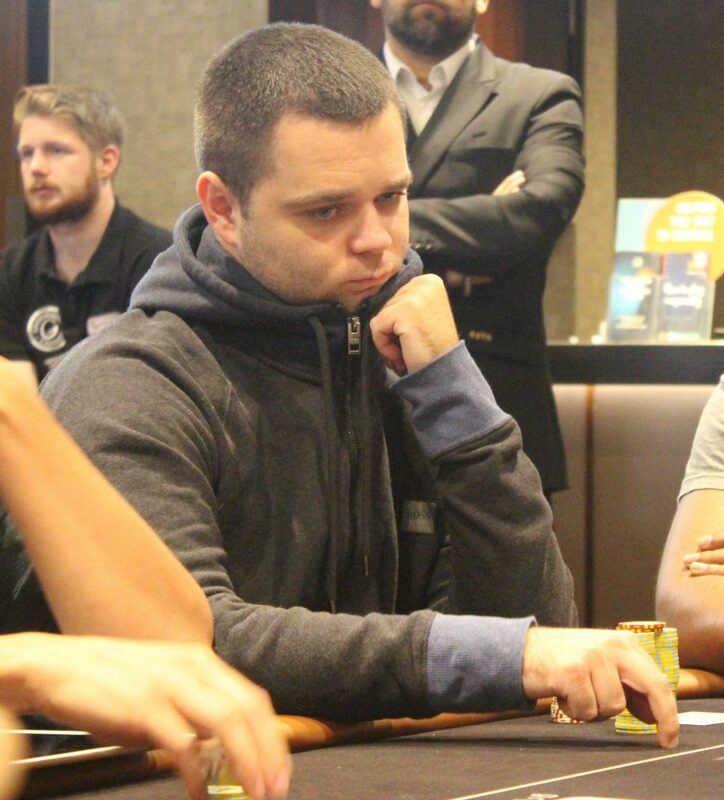 We lose Irish open Winner Ryan Mandara in 11th place for £2,550. Tomasz Szczerbinski gets his short stack all in holding Ace-8 against the of Vikrum Mehta. 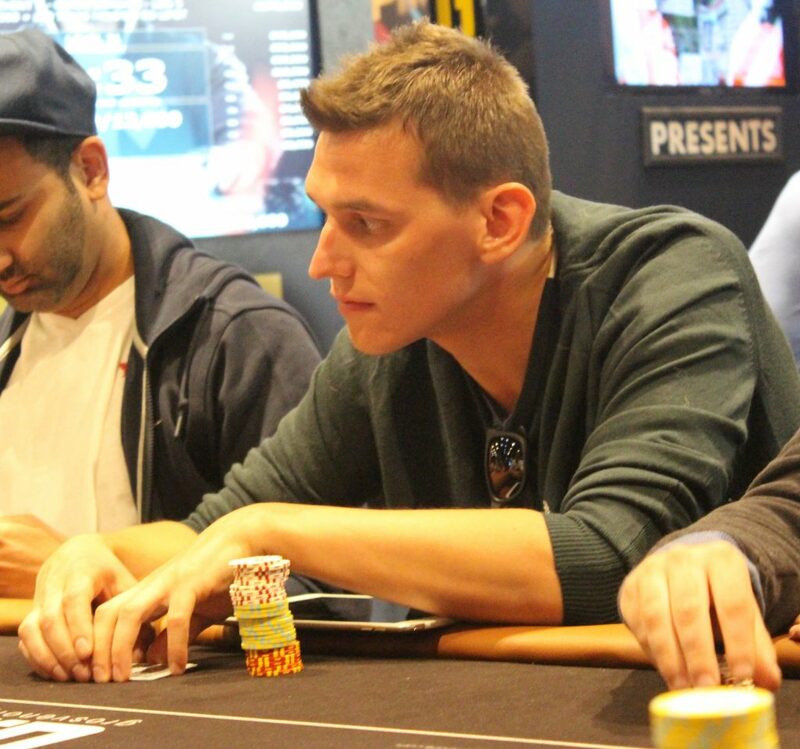 The flop comes giving Tomasz top pair, but Vikrum a flush draw. The turn card comes !! Flush for Vikrum as he now has a lock on the hand. The river is another ace giving Tomasz trips for a rub down. He leaves us in 12th place for £2,300. 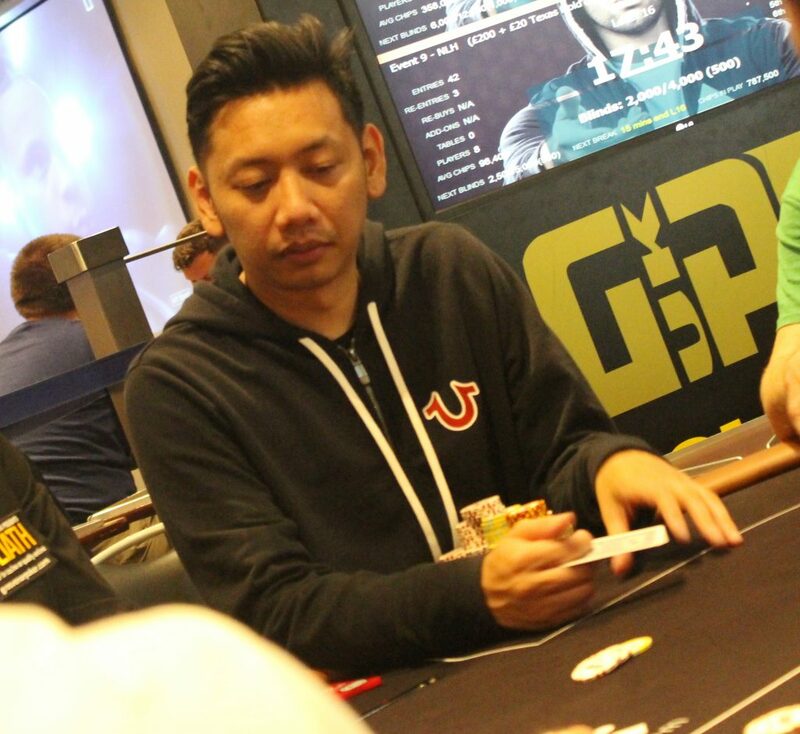 Vikrum increases his chip lead to 1.45million!! The blinds are now 10,000/20,000 with a 2,000 ante. Break time now fr the players as we take 15 minutes. It’s hard to keep up here as we lose another two players. 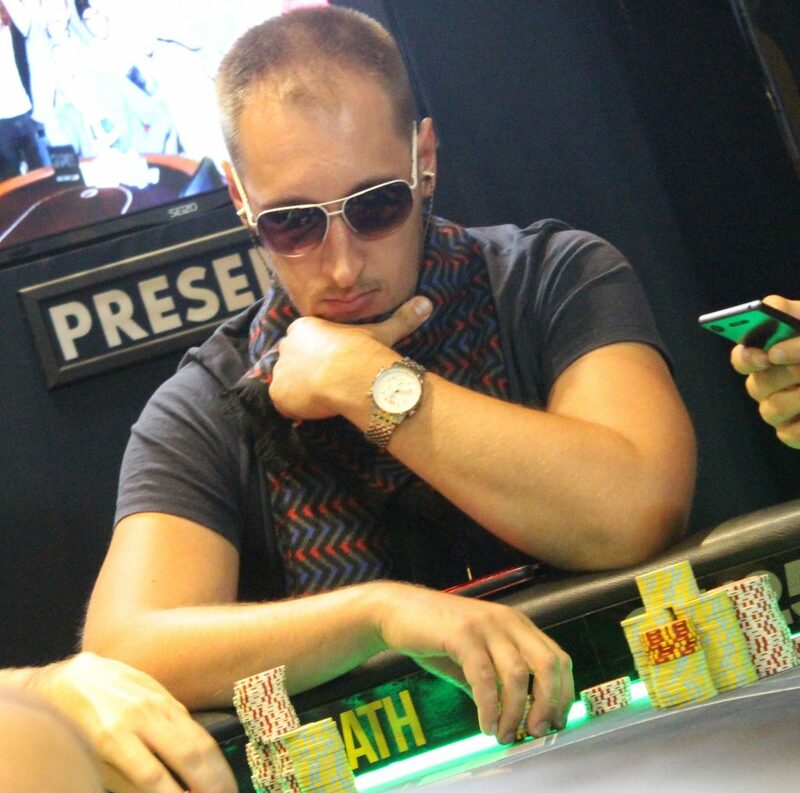 Justinas Pactauskas finished in 14th place for £1,950. 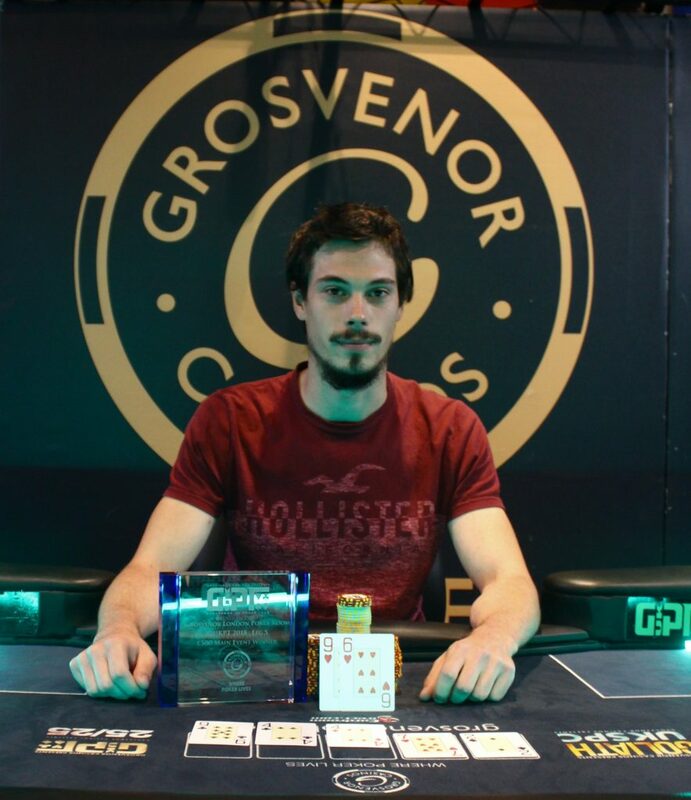 Michael Rowan takes home £2,150 for 13th. 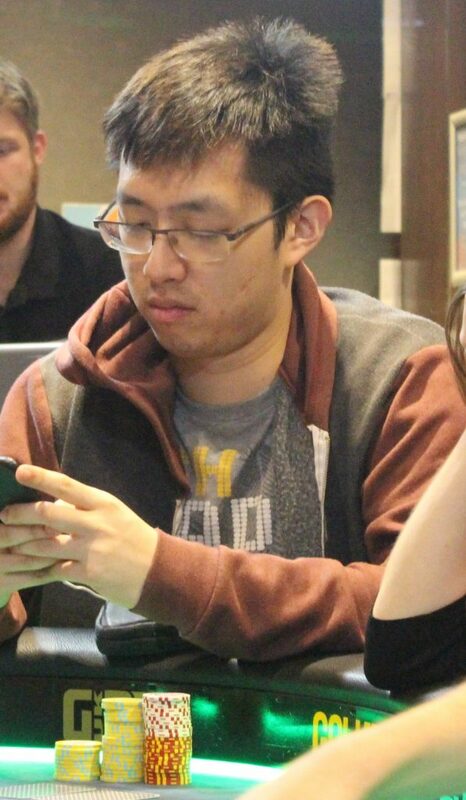 We get to the table as Dahe Liu has his short stack all in holding Ace-King but has run into the ACES of Vikrum Mehta. 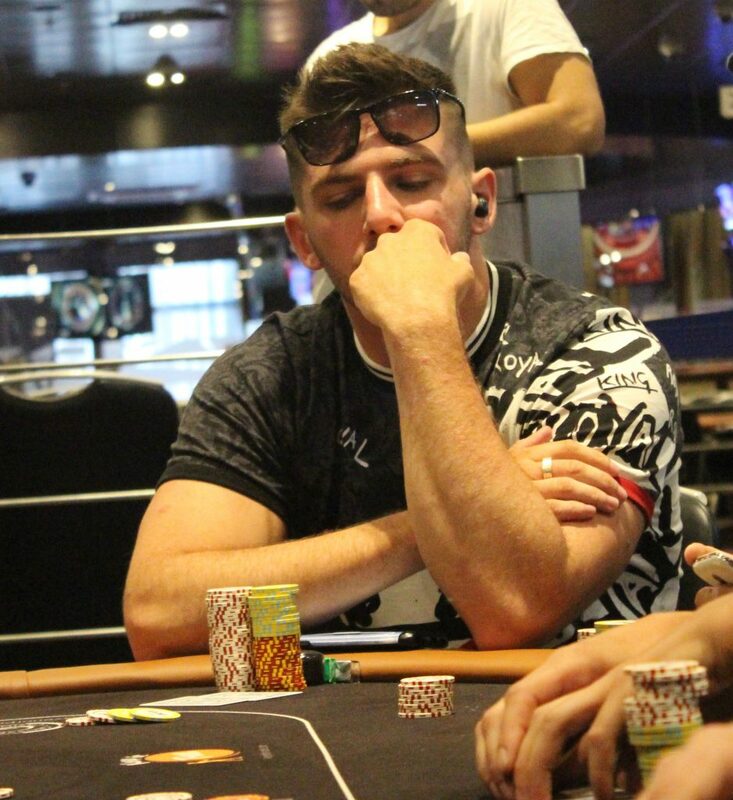 No miracle on the board for Dahe and we lose him in 14th place for £1,800. 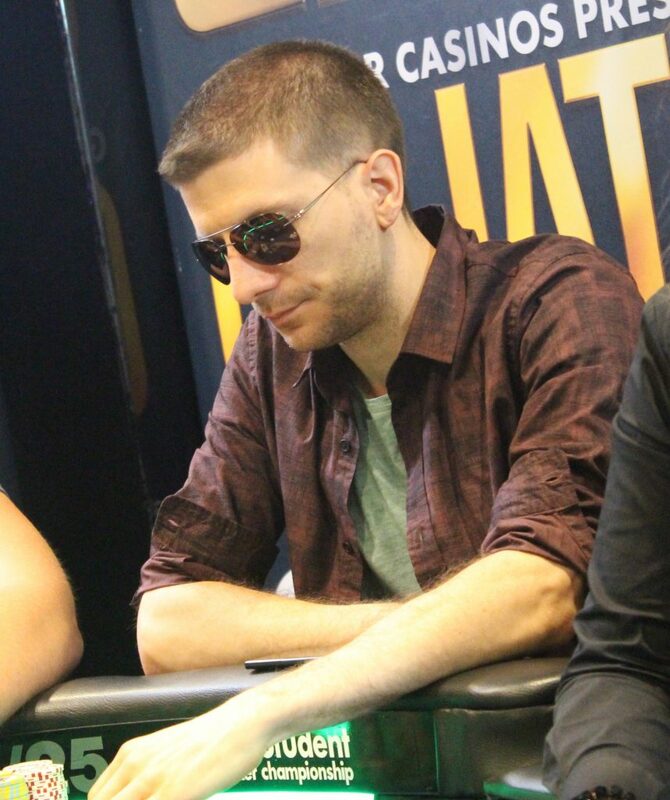 Vikrum is now chip leader of the tournament with 1.25million! Adrian Balica in 17th place for £1,600. Then on the other table we lose anon in 16th place for £1,800. 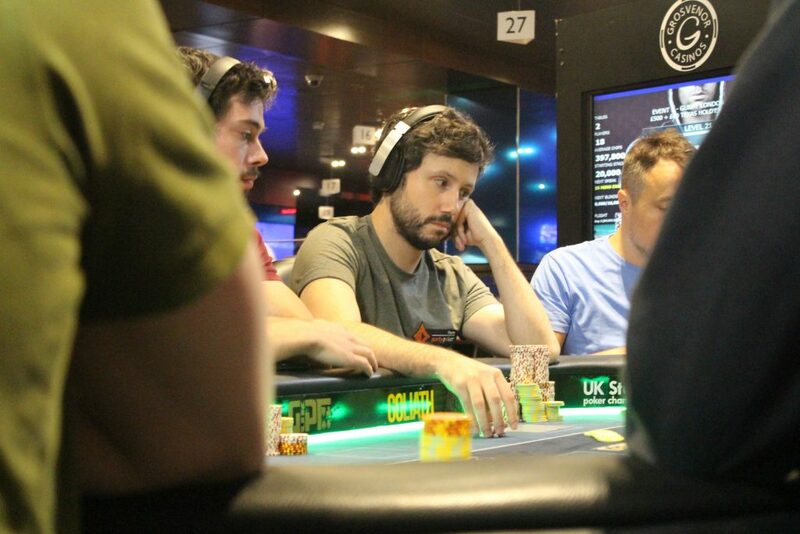 Matteo Mutti is the next player to bust the main event. He finishes in 18th place for £1,600. 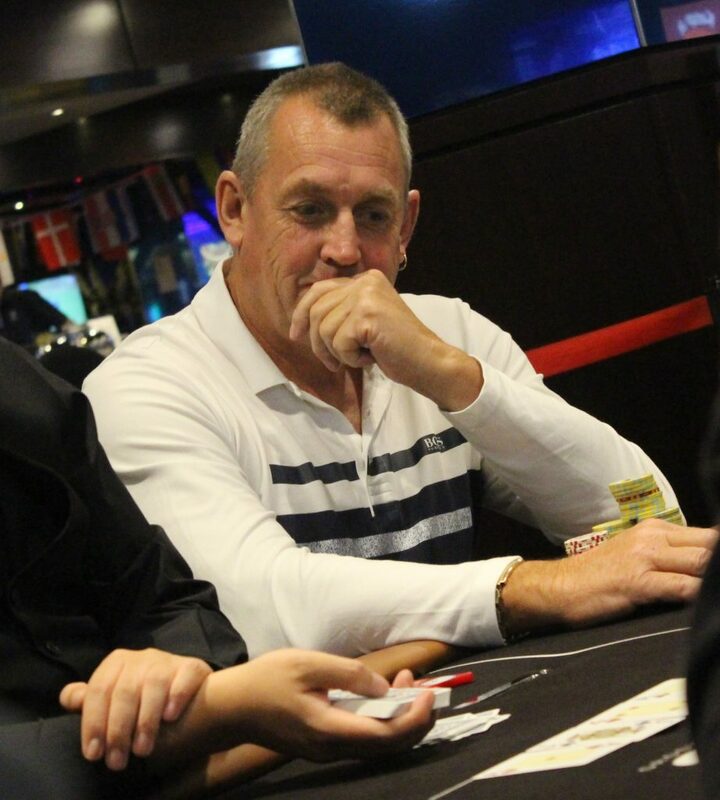 Kev Houghton is the beneficiary taking Matteos chips an increasing his stack to over 500k. They are now 8,000/16,000 with a 2000 ante. Joe Grech is the first player to leave us, all in holding 8-9 and is called by Paul Scipioni with A-Q. No help for Joe and he leaves us in 19th place for £1,600. With his exit we are now down to the final two tables. The blinds are 6,000/12,000 with a 1,000 ante. We should be underway in 10 minutes. 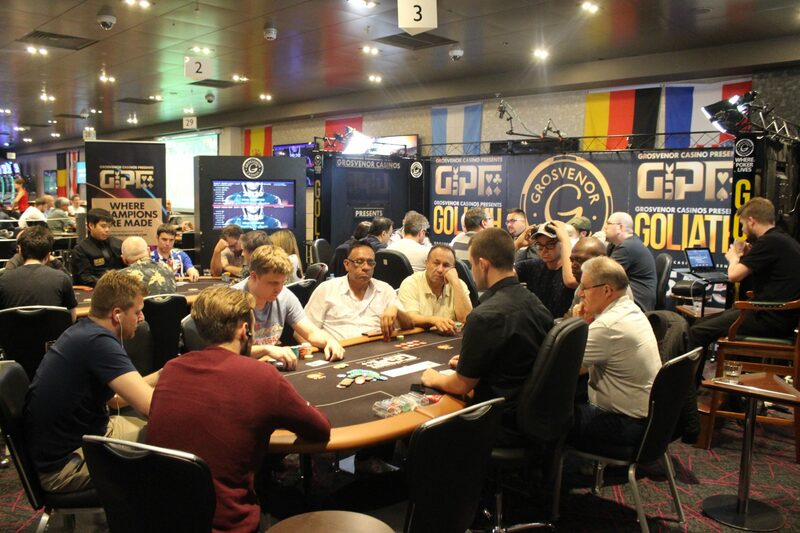 Good afternoon and welcome back to the third and final day of the GUKPT London Main Event. From the 358 entries, we have just 19 players making their way back today. The players are guaranteed a cash of £1,600 for making Day three, but they all have their eyes on the first placed prize of over £49,000!! Play will begin at noon today and we’re looking forward to what should be another great day of poker. We have no previous Main Event champions in the field, so we will be crowning a NEW GUKPT Champion! !